Over the weekend, the Winona Lake, Ind., Grace Brethren Church (Bruce Barlow, lead pastor), hosted it’s annual outreach, “We Care Warsaw” for the 10th year in a row. The local online news site, InkFreeNews, reported on the event in a story yesterday. A portion of the story appears below. Click here to read the complete article and view additional photos. 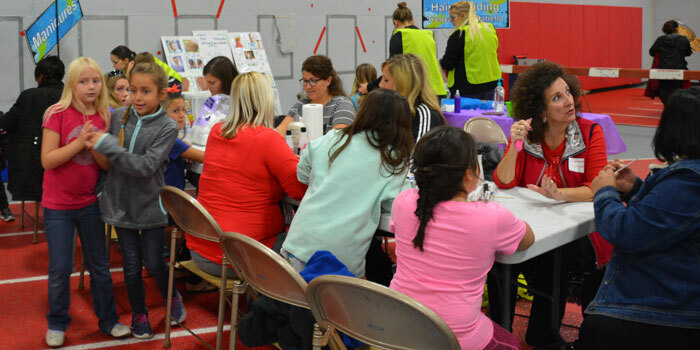 Women and girls gather to get their nails painted at “We Care Warsaw” Saturday night. A picture, it’s one of the most precious things families walk away from “We Care Warsaw,” but it wasn’t something Coordinator Dave Rank ever expected when Winona Lake Grace Brethren Church started “We Care Warsaw” 10 years ago. “We Care Warsaw” celebrated its 10 year Saturday night, Nov. 11, at Grace College’s Gordon Rec Center, continuing to help low-income families in Warsaw. “Some families would come back, and they would go and get their nails done, they would get a haircut and they would get makeup. Then they’d go get their family picture taken, and sometimes the families would come dressed as coordinated colors. They would tell us that was the only family picture they’ve ever had taken,” explained Rank. Click here to read the complete article and view additional photos.